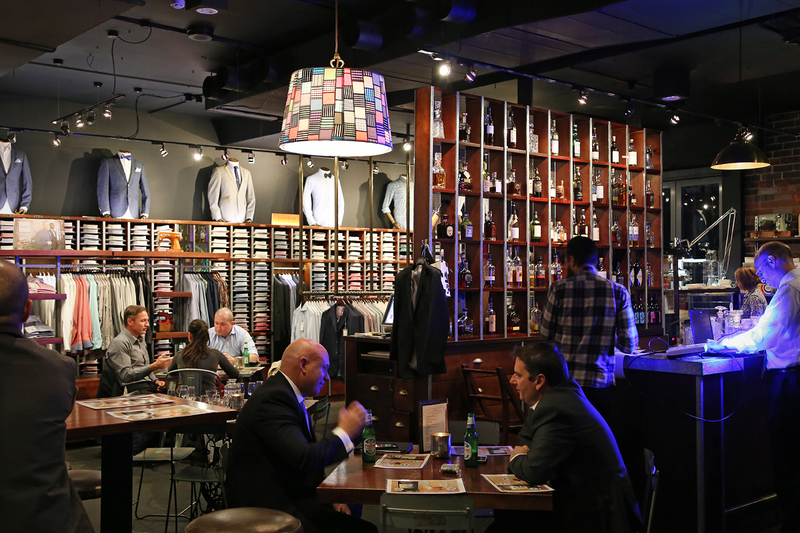 The other week the Shirt Bar in Sydney held a very special Scotch Club event in conjunction with the Australian chapter of the Scotch Malt Whisky Society (SMWS). 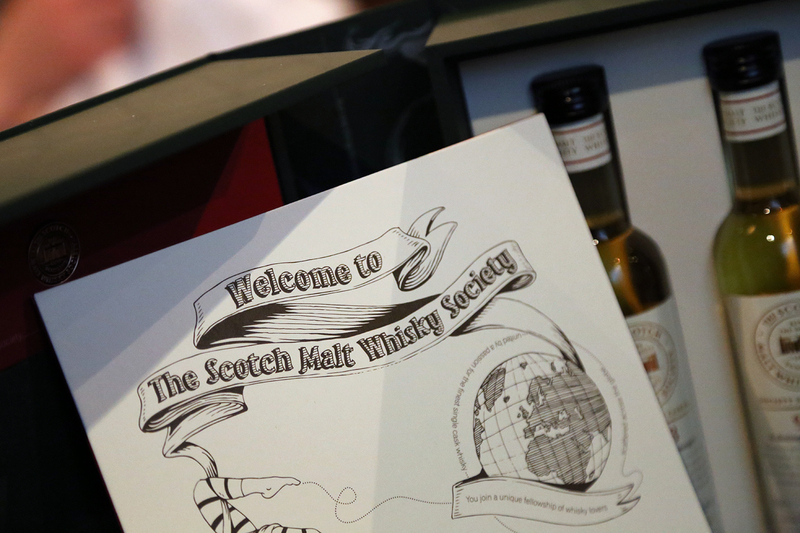 I’ve been to a few Scotch Club events before (here and here) and I’m also a member of the SMWS, so I knew this would be a winning combo. Even more so as the evening was being hosted by SMWS Australia’s Cellarmaster, the affable Mr Andrew Derbidge. For those who’ve never met Andrew, he has to be one of the most knowledgeable and approachable whisky figures I’ve come across. 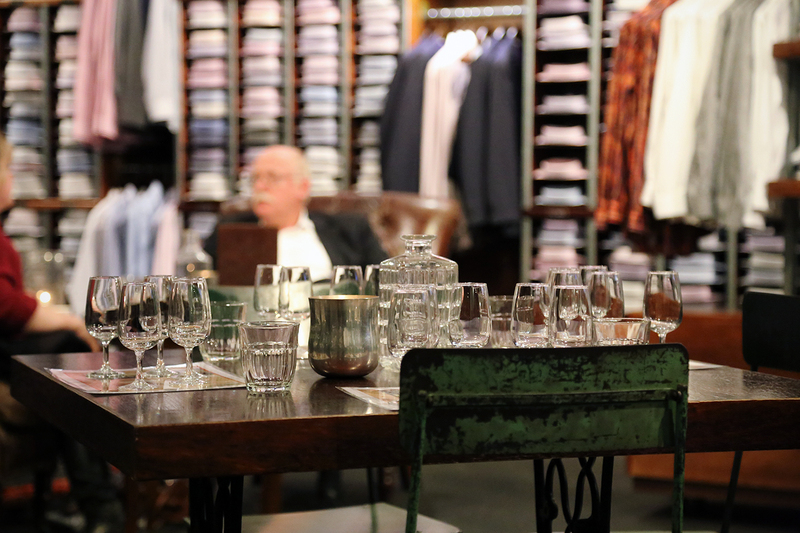 His presentations are always jam-packed with interesting info, yet never bore – irrespective of your level of whisky knowledge or interest. 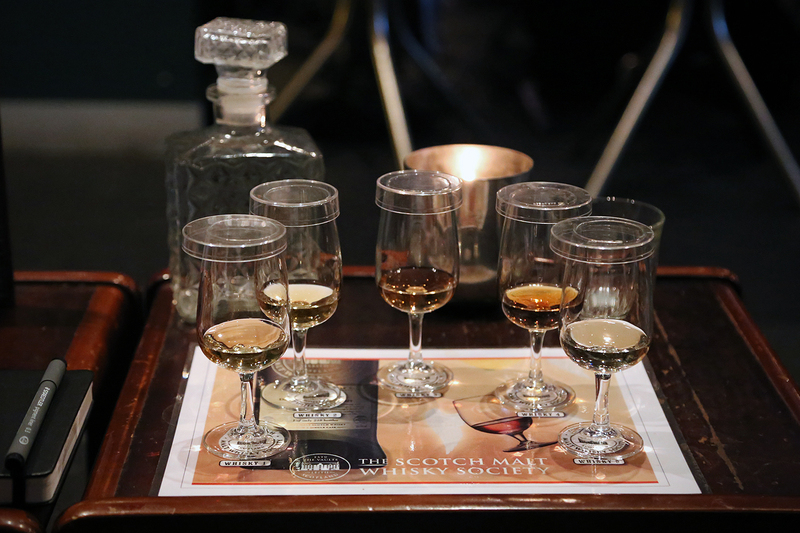 They’re all cask strength, natural colour and non-chill filtered. 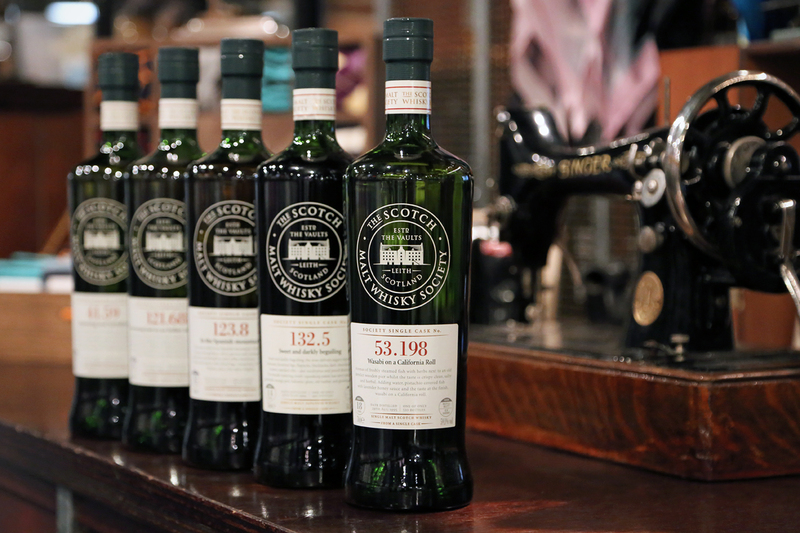 Bottles will never be repeated, so when they’re gone – they’re gone! In the images to follow, you’ll note that the labeling contains an odd numerical code. 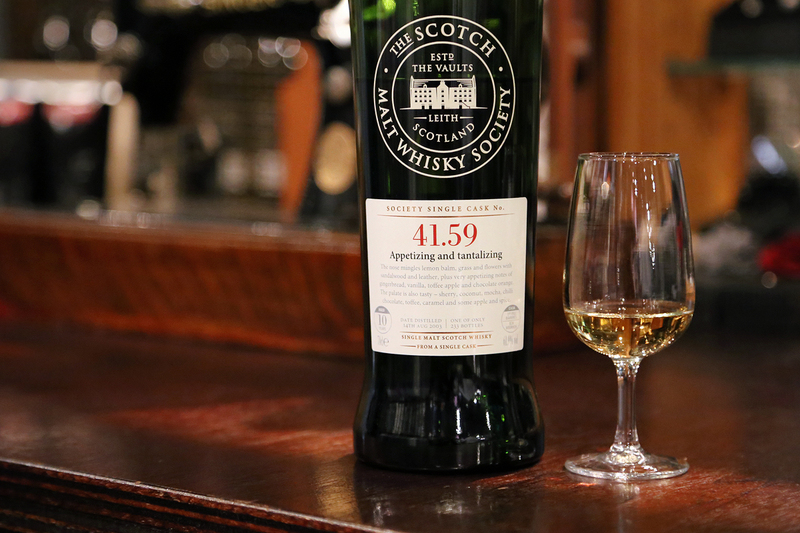 Quick intro if you’re not familiar with the SMWS’s labeling system – the first number represents the distillery the whisky came from and the second represents the number of casks that have been bottled by the Society, from said distillery. The brilliant names? Well, that’s the domain of the chaps in the Society’s creative department I guess! The line-up consisted of six pretty special bottles, including two not previously seen as part of Australia’s quarterly outturn (yes, think yourselves lucky my UK friends, we’re a long way away from Scotland, so our Outturn is only quarterly). First up was this ten year old whisky from a Speyside distillery by the name of Dailuaine. 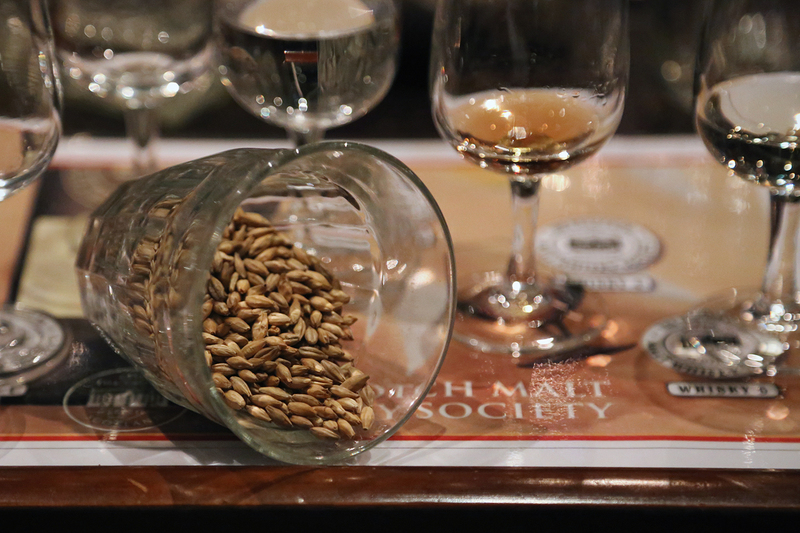 You may not have heard of them, but chances are you’re consumed their whisky before. 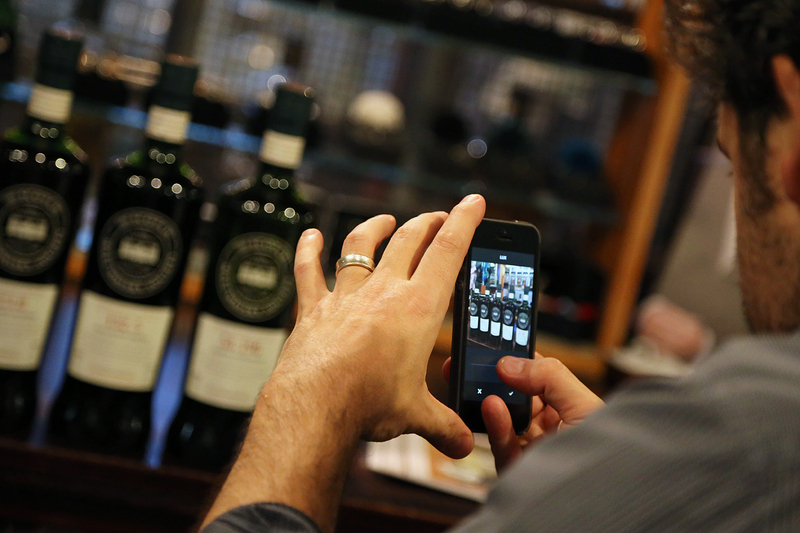 Dailuaine is owned by Diageo and the majority of their output ends up in the various Johnnie Walker blends. 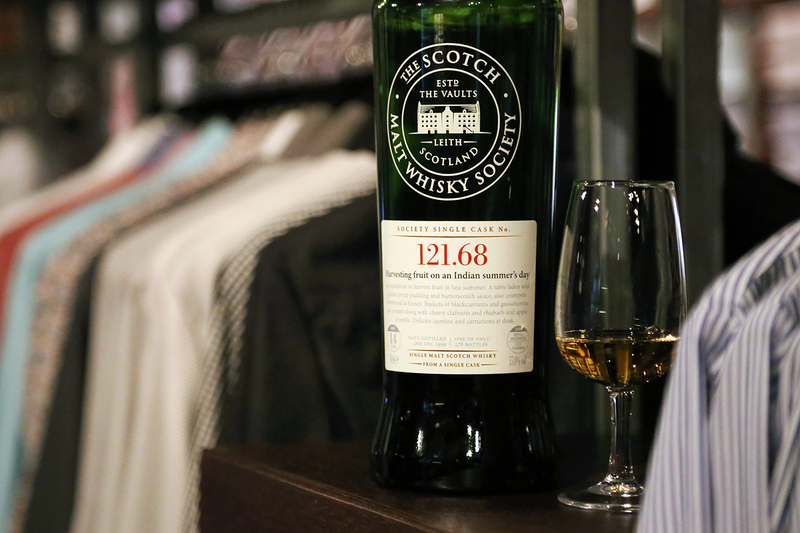 A super small amount of this stuff is bottled as a single malt – let alone singe cask, cask strength – so it was pretty special to have this. Very fruity and quite light on the nose. Summer fruit salad, pineapples, pears, apples and some tart piney notes dominated, while some softer vanilla and sweet floral notes hid up the back. Quite a light nose with a decent amount of spirit prickle. Light on the palate as well, yet rather oily at the same time. I found that it initially sat quite high before unleashing a decent amount of spice and some big tangy and tart pineapple notes that sent the saliva glands into overdrive. The finish was long with quite a bit of heat and some oaky spice, somewhat balanced by a noticeable vanilla note. Before moving on to dram number two, Andrew paused for a moment to take us back a few steps, presenting whisky in its naked new make spirit form. 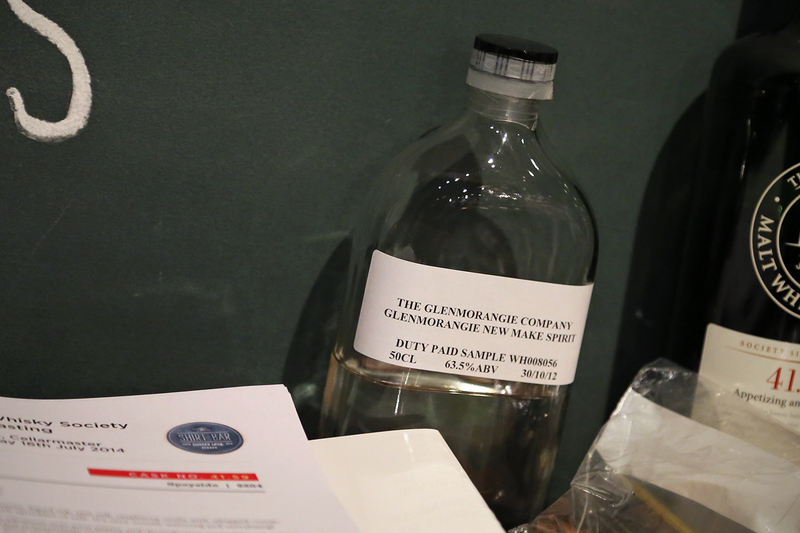 He busted out this small sample of Glenmorangie new make spirit, which comes off the stills at an industry average of 63.5% ABV. I didn’t spend too long with this, but as you’d expect, it was very grassy, slightly dusty and botanical on the nose (they often remind me of Mezcal) and hot and saliva-inducing on the palate. I had to have a chuckle when a guy near me nosed his glass and exclaimed to his mates ‘oh man, that’s smells like unleaded petrol’. Not the most interesting new make I’ve tired, but I always find it really interesting to sample the building blocks of whisky, and trying new make from a hugely popular Scottish distillery is not something you get to do often! Next up was this 14 year old dram from a fairly young island distillery, Arran, which opened in 1995. A noticeably heavier nose on this one compared with the Dailuaine. Sweet esthery polish notes, sour green grapes, caramel – almost on the verge of burnt bitter caramel. Initially the nose seemed quite closed, but given some time it changed quite a bit, developing some meaty fermented grape notes and gummy lollies, in particular, strawberries and cream. Creamy and oily on the palate, straight off the bat. Tropical fruits, sweet spice and overall, a very round profile. The back of the palate became almost drying, with a hint of kiwi and some slight salty notes. A long fruity finish (reminded me of tinned tropical fruits). 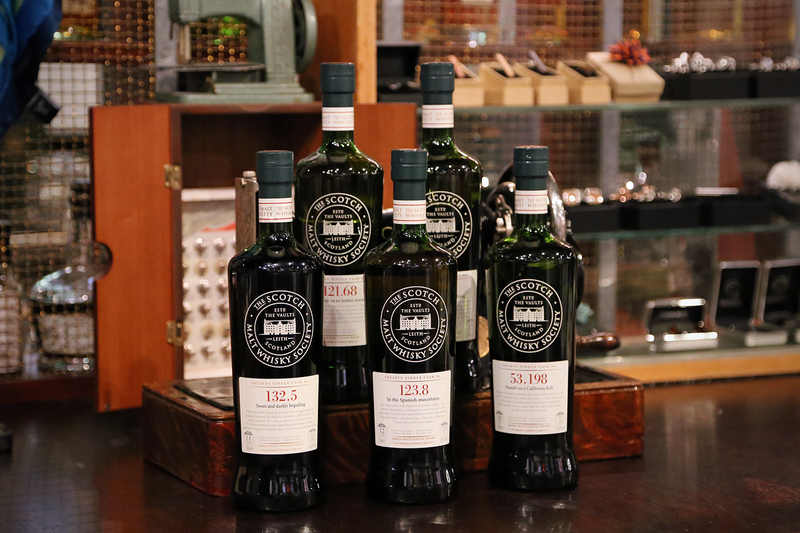 As far as I can tell, the Society has only ever bottled eight casks from this distillery, making it somewhat of a rarity and indeed a priviledge to be tasting. I’m talking about Glengoyne and this particular bottle was matured for 12 years in a refill port pipe. Quite a dense, heavy nose on this dram. Spice, Vegemite, a touch of salt, tart plum jam or plum butter (reminded me of my favourite Polish powidła) and some hazelnuts. Not overly sweet or sugary, but also not overly fruity. A very interesting nose, though I’m still not sure how much I really liked it? Lovely oily mouth feel which was both rich and winey. Spice developed quite quickly, but a winey sweetness remained the whole way through. The finish is where I felt the port notes really showed, with some lingering plummy prune flavours, more spice and a decent oakiness. An enjoyable and really interesting dram, but if I’m being completely honest, I think I prefer Glengoyne’s spirit when it’s been bourbon or sherry cask influenced. Not actually a Scotch, this next whisky hailed from one of Japan’s most revered and lauded closed distilleries, Karuizawa. Big, rich and syrupy on the nose. Sweet raisins, stewed plums, figs and Christmas cake. So rich, yet surprisingly clean. I’m not sure how to describe exactly what I mean by ‘clean’, but despite the heavy sherry influence, the nose came across as really quite bright and active. The theme continues with a rich, creamy, syrupy palate. Tangy raisins and dark red fruit, there’s some spice, but I found it somewhat restrained for such a heavily sherried whisky. Slightly prickly, dense and a hint of old char smoke. A long and warming finish remains sweet and fruity with some oaky spice showing at the tail end. Such a clean sherry cask in my opinion. I wondered whether this dram had star status in my eyes because I knew it was from a closed distillery and knew it was rare. But I’ve been fortunate enough to try it on two or three occasions now – on its own and up against a number of other whiskies I regard quite highly – and each time it has stood out as something pretty special. Time to bring on the peat! It was around this time of the night that Andrew revealed his last sensory item for the evening, some freshly peated Ardbeg malt. I love the smell of Ardbeg, but this was something else. Burrying my nose right in there, the glass was full of cereal and grainy notes but they were overlayed with that amazing smoky sweetness. I know it would probably taste like rubbish, but in that moment I could have eaten that glass full of malt with a spoon. A rare treat to encounter Ardbeg malt in Australia, that’s for sure. I have no idea how he got a big zip-lock bag of malted barley past Australian Customs on the way back in from his recent trip to Scotland, but I’m glad he did. Andrew – if you smuggled this in your jocks, I don’t want to know about it. The last dram of the evening was also the oldest of the night, a lovely 18 year old coastal dram from Caol Ila. On the nose, I found this to be rather tangy and salty up front, with fragrant peat and a fairly light smokiness. A hint of iodine, but nowhere near as medicinal as the likes of Laphroaig. In a moment of poetic wankerism, I wrote down ‘a coastal BBQ with sea spray’. More smoky on the palate than the nose, a lovely oiliness to the mouth with some spice, saline and drying hay. It had a certain fruity quality to it as well though, with grilled peaches (burnt perhaps?) and a tangy peat, sweet and savoury finish. Really quite lovely and balanced. 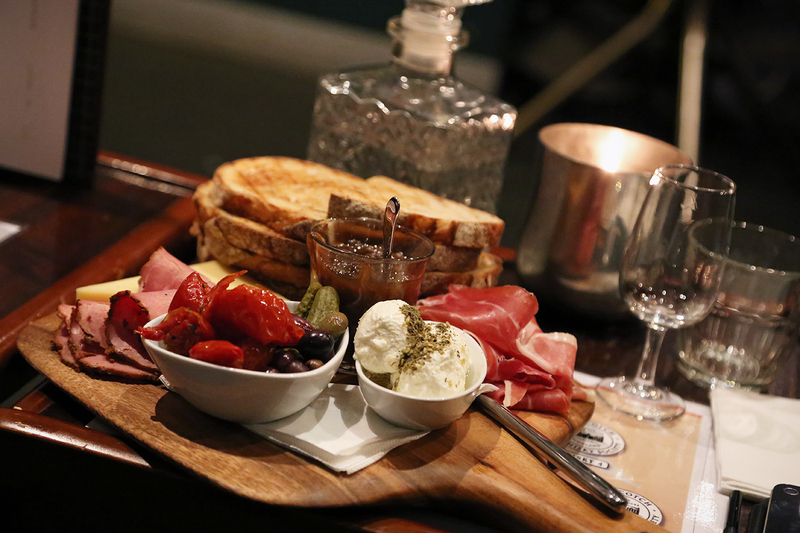 In true Shirt Bar fashion, the evening’s Scotch Club finished off with their trademark antipasto board & pies. 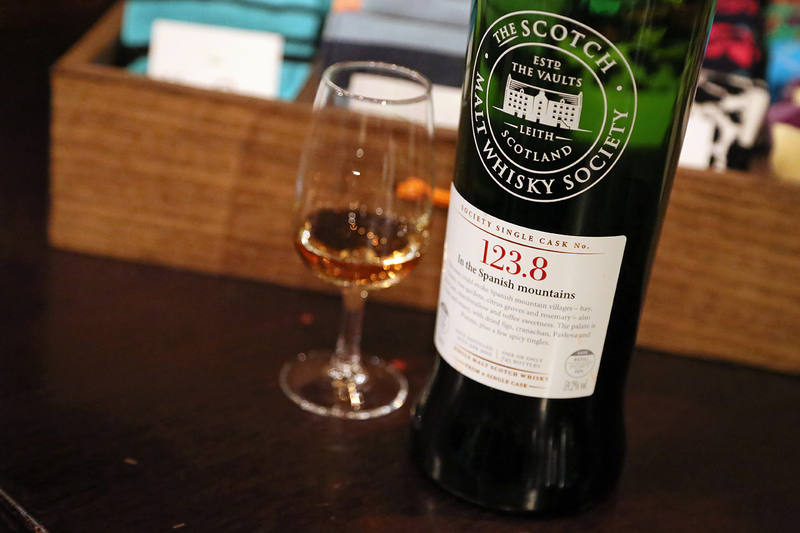 This round of Scotch Club was perfect for those who’d never been to an SMWS event and wanted to see what all the fuss is about. 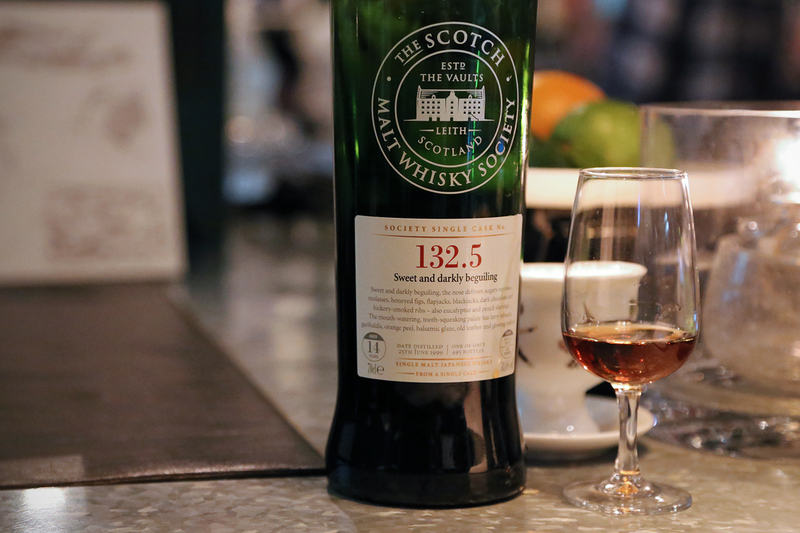 As an existing member, I took it as a perfect opportunity to get my SMWS whisky fix between Outturns and taste a few new expressions I hadn’t come across before. A seriously enjoyable tasting. I was originally going to write something along the lines of ‘if you missed out, not to worry – there’s another one being held on August 13th’. But you can forget that. It went on sale the other day and completely sold out – in less than 24 hours! If you do have a ticket, I’m not sure that you’ll be tasting the above, but whatever Andrew brings, they’re bound to send those taste buds into overdrive! 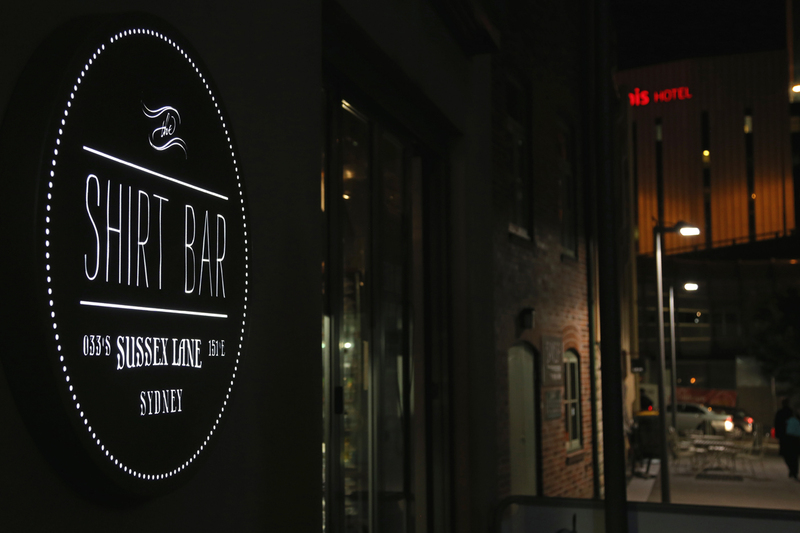 If you didn’t manage to get yourself a ticket and want to find out more about the Society, head over to their website and keep en eye on their tastings and events page to see when an event is being held in your capital city. Thanks so much for the kind comments! Glad you enjoy the blog. Love the layout and concept behind Great Drams as well!